One of five factory Type 39, 1500cc, 8 cylinder cars, it was built in 1925 and was numbered 4604. 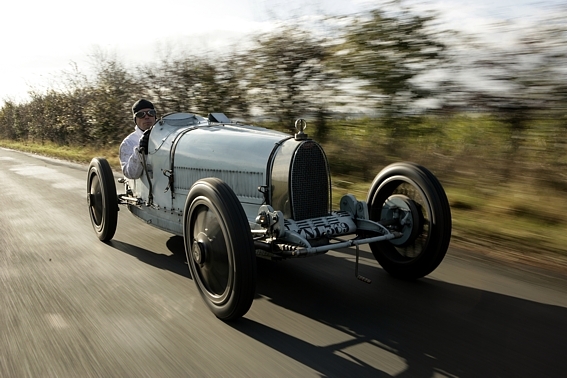 1925, the year of manufacture, was a pivotal year in racing history. Only cars from ‘bona fide’ factories could enter GP races, whereas many later models were sold to independent drivers and entered privately. These five T39 cars were originally campaigned and maintained exclusively by the factory. They had identical chassis and engines, running beaded edged tyres on aluminium wheels. With unblown, roller bearing crankshaft engines, they were the factory prototype for the blown T39s campaigned so successfully by Bugatti in the 1926/7 seasons. 4604 is the only surviving example in original format and condition. The last similar car to appear in England was driven by Malcolm Campbell at Brooklands in 1926. The history of the car is that it was entered, with its four identical sisters, in the July 1925 French Touring Grand Prix at Montlhéry, for which it was temporarily fitted with a touring body required for the race. It was driven by ‘Meo’ Constantini to finish first. The other four cars, all but one finishing, were driven by the brothers Pierre and Ferdinand de Vizcaya, Giulio Foresti and Jules Goux. Having proved the new cars durable in the gruelling endurance race at Montlhéry, the Bugatti factory quickly returned all five T39s to the standard GP body format in only four weeks, to be entered in the Italian Grand Prix at Monza on the 6th September 1925, with the same drivers, in anticipation of the new Grand Prix 1500cc formula. Once again driven by Constantini, 4604 performed well, finishing third overall behind two larger Alfa P2s (2000cc cars), and closely followed by three more Bugatti T39s, whilst the fifth, driven by Goux, having led all the way, had had to retire just prior to the end of the race with a leaking fuel tank. With this race, Bugatti proved that the change to the 1500cc formula was going to be more exciting than was first feared, and again demonstrated the T39’s phenomenal reliability, with all five cars performing well. Just after the Monza race in 1925, the car was sold and shipped to Australia, along with her sister, 4607. Giulio Foresti, one of the Monza drivers, had a hand in this transaction. During the late 1920s and early 1930s both cars were campaigned in Australia in local and national races. Car 4607 went on to win the Australian Grand Prix at Phillip Island in 1931, driven by Carl Junker. The current owner purchased 4604 from Gwen Lobb whose husband Ted bought the car in 1936. Ted Lobb never campaigned the car but kept 4604 carefully in fine original condition at his property in Western New South Wales. Deportation from Europe seems to have been the saving of 4604, as it is now unique in not being having been modified from the Monza specification, and indeed it is the only remaining unblown T39 in the world (from 1926 all the 9 subsequent T39s were blown). It was last licensed for use in NSW in 1950, and last seen in public at Wagga in 1966. The car, not having run for many years, was shipped to England in 2005 and has been sympathetically re-commissioned by Charles Knill-Jones at Tula Engineering for its current owner. The car ran at Phillip Island, the VHRR Rob Roy Hillclimb, and the AGP Historic Demonstrations, but as far as I know, has now returned to the UK.